Paperwork is my weak point. In the past I organized my paperwork using empty diaper boxes. I decided it is time to take control over the paperwork clutter in our home. As a result, I am giving you helpful guidelines to tackle your paperwork clutter. Before I decided to officially organize my paperwork like an adult I would separate it into three boxes. Garbage, shred, and keep. While this is fantastic for quick decluttering of kitchen tables, offices, or desks it’s not at all efficient in truly organizing. 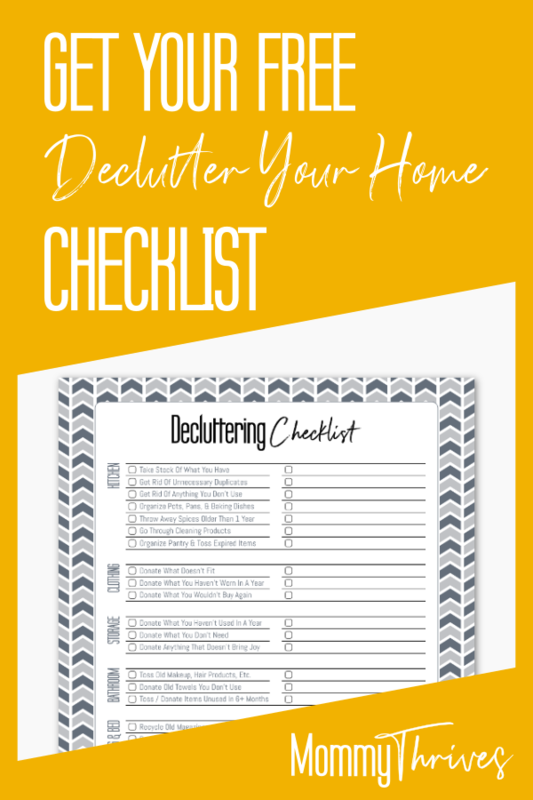 Check out my post How to Declutter your Home. There are only a few things you actually need to file. You don’t need a large filing cabinet anymore thanks to the many technological advances that we now use. A small filing box will do the job of a cabinet and can easily be stored in a closet. You can also check out the ottoman filing cabinet that I feature in How to Create a Productive Office Space. You can find a different filing box with these search results. I recommend the Sterilite Portable File Box as it’s a nice looking file box with great reviews and a decent price. The best seller is as always your typical banker’s box. They are cheap and while they don’t look the greatest it still does the job well. There is very little that you need to put into your filing box. These things include tax forms for seven years. The IRS recommends holding on to these forms for at least seven years in case of audit. These include business taxes. File away warranties for fridges, stoves, baby equipment, and any other warranty that is not related to big purchases like homes and cars. There is a full on list of paperwork you need to make sure you protect. Everything in this list should be put into a fireproof box or safe for protection. This is also your bail out box. Make sure your box is large enough to hold everything, but small enough to carry. Here’s a search of fire safe boxes. We have used this SentrySafe Fire Safe in the past. However, as our need of more room grew we decided to go with this Sentry Safe 0.61 cubic foot Fire Safe. We stick with SentrySafe because their products are rated well. Both of these safes are rated at 1550 degrees and ½ an hour of fire time. Plus, in case of a fire Sentry Safe will send you a new safe to help you get back on your feet. In case of an emergency like an evacuation order or natural disaster this box holds all of the important paperwork you will need. It’s always better to have it than not. Stop filing those bills and payments. Seriously it’s no longer necessary. Scan bills and the payments associated and file them neatly into folders. You can store the files on a cloud. If you are one of those people who don’t trust the cloud you can create backups on external hard drives. Those backups should go into your fireproof box for safe storage. While you are backing up your bills create a backup of business files or any other documents you don’t want to lose. Now that you have filed, protected, and scanned the majority of your paperwork the rest of it falls into one of next two categories. The first of the two is garbage. The second is what paperwork to shred. Check out my post Time Management Tips For Work At Home Moms. I know a lot of people who get concerned over what paperwork is ok to just toss and which to shred. As a rule of thumb I say if you are unsure if it’s ok to toss shred it and stay on the safe side. Shred anything with sensitive information that could lead to account hacking or charges. This means old phone bills, things with your SS #, tax forms that are 7 years or older should all be shredded. It’s always better to be safe and shred anything with personal information. In the past, I have been known to shred anything with my name and address. While nothing can be done with that information alone I always swayed on the side of caution when it came to paperwork. Check out my post 10 Creative Home Office Ideas. Toss any junk mail, old utility bills, envelopes, old warranties or anything that does not have sensitive information on it. Make a habit of tossing these things right away to prevent build up of unnecessary paperwork on your desk. The trick to keeping your paperwork under control is to keep handling it as soon as it enters your home. Simply tossing the envelopes and junk mail, scanning, filing, and protecting your paperwork immediately lessens the amount of time you spend monthly straightening out your paperwork. Do you have any tricks to keeping your paperwork under control? Leave a comment below, follow me on Pinterest, and pin this to your favorite organization boards.